Darleen Rubin is a professional photographer specializing in fashion, lifestyle and celebrity portraits. Her work has appeared in The New York Post, W, Men‘s Wear Magazine, and on the cover of Women’s Wear Daily. Her vast archive of celebrity portraits includes images of Jacqueline Kennedy Onassis, Joe Namath, Mary Tyler Moore, and Elizabeth Taylor. In 2011, she was the still photographer for the independent film Somebody’s Hero, and continues to document the changing streets of her West Village neighborhood as she has for many years. DR: Louise Dahl-Wolfe. She was a person of great style, and was able to bring out the depth of each person in her portraits. 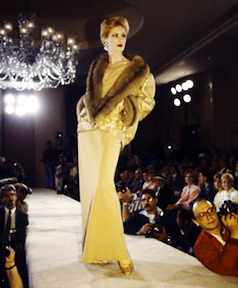 In her fashion work, she promoted elegance and beauty. She also had great personal strength that enabled her to establish herself as a photographer in a male dominated world, yet be respected by art directors and editors of both sexes. DR: Little did I know when I began taking photographs at age 10 of my younger sister dressing up in Grandma’s old clothes, that I would one day be photographing beautiful clothes draped on beautiful and elegant women and handsome men for newspapers and magazines. I found my own voice early, but was encouraged by seeing that other women had the same penchant. Women such as Louise Dahl-Wolfe showed the beauty of women and the clothing that adorned them, accentuating their grace and regal comportment which was important to me. 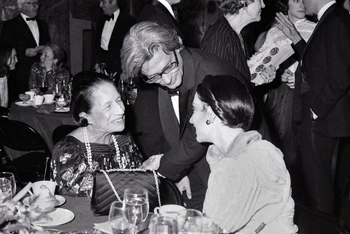 Working at Women’s Wear Daily gave me the opportunity to see beauty and express my appreciation of beautiful women, elegance and style, just as I think Louise Dahl-Wolfe did at her 22 years at Harper’s Bazaar. DR: That I had an imagination, and should feel free to use it. It’s what gives me ideas, and is a source of creativity. Also, that I love beauty, and want everything and everyone to look beautiful. DR: I was shooting a News & Documentary Emmy Awards event, with two powerful strobes set up. I had to work fast at these events, and had photographed many, many people, and my equipment always held up. I had just photographed James Earl Jones and George McGovern, and the lights were firing. But when James Lovell [Captain of the ill-fated Apollo 13 mission], the President of NBC News, Dateline, and other execs were on the seamless, they wouldn’t fire. I did a check of all my equipment, but everything looked okay. It was every photographer’s nightmare. I raised my head, closed my eyes, and said, “God, I have a problem….Help!” And immediately I felt calm. I looked at the power pack and pressed a button which released the power, and the problem was solved. DR: Shoot what you love, and be intrepid, always! Louise Dahl-Wolfe was born in in San Francisco in 1895. She studied at the California School of Fine Arts and Columbia University. In 1923, she married Meyer Wolfe and began to photograph. In 1933, she opened a studio with clients that included Bonwit Teller and Saks Fifth Avenue. As a staff photographer for Harper’s Bazaar from 1936 to 1958, she pioneered the use of natural light and location shooting for fashion photography. Her elegant and dramatic images have influenced many photographers, including Horst, Richard Avedon and Irving Penn. From 1958 to 1960 she freelanced for Vogue and other publications. She died in 1989. 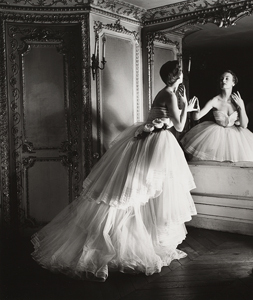 Professional Women Photographers gratefully acknowledges the Center for Creative Photography for permission to use of the Louise Dahl-Wolfe photograph, Model in Dior Ball Gown, Paris.